On April 25, 2018, Theha BV, producer of the well-known coconut bread slices and coconut cubes, was taken over by the management team, Gijs Kakebeeke and René Jansen, with Berk Partners as financial sponsor. Former owner Bram Theunisse takes a step back and remains involved in the background as a shareholder. 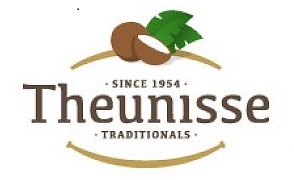 The family business Theha b.v. makes coconut products since 1954. 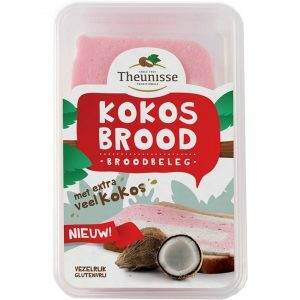 Bram Theunisse, the third generation of this coconut bread bakery family, grew up with the company and its products. In the 18 years that he was at the helm, the production activities have moved to a modern production location and he has managed to create strong growth with innovative product concepts without losing sight of grandpa’s old-fashioned tasty recipes. 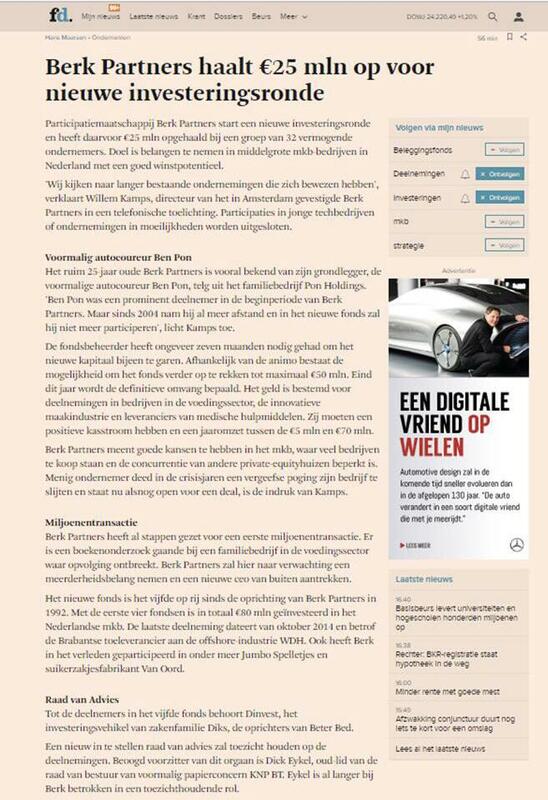 After this intensive and successful period, he chose to transfer the company to Berk Partners, Kakebeeke and Jansen. They have the desire and the ambition to further develop the proven success formula with the right knowledge and new energy. This includes the further development of export and a greater focus on plant and health, with no added sugars. The new CEO Kakebeeke has a broad background in the food industry and is looking forward to taking over the operational management of the company. Jansen, with his 13 years of experience within the company, will continue to focus on commerce, development and quality in order to realize the growth. Bram Theunisse remains involved as an advisor. Theha is the specialist in creamy coconut products for bread, with meals or as a snack. At Theha the coconut bread for on a sandwich is prepared. Who did not grow up with it? Easily put on a sandwich in the best colors and delicacies, without crumbling! Available in different variants, including fiber-rich, gluten-free, vegan, organic and kosher. All prepared with the tastiest coconut from Southeast Asia. Theha also produces different varieties of tasty, soft coconut cubes that are successfully sold as a snack and are used, among other things, as an ingredient for nut mixes and granola’s, as an interior for chocolate dragees and as a decoration for cakes and pies. In the modern production facility in Harderwijk, the production processes are carried out in a food-safe, efficient and largely traditional manner in order to give optimal taste and smoothness to the products. Theha has an annual turnover of around € 5 million with twenty employees. Berk Partners is expected to launch its 5th fund in 2018. 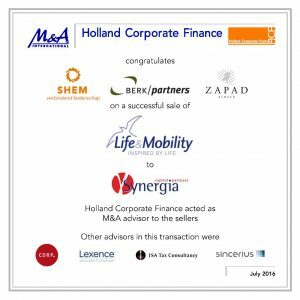 Investment company Berk Partners congratulates Life & Mobility with the successful sale to investment company Synergia. In 2010, Berk Partners IV together with the management acquired all shares in this producer of wheelchairs and mobility scooters in Doetinchem. In recent years, the company has experienced strong growth, partly through organic growth and partly through a number of acquisitions. In addition to the Netherlands and Belgium, the company is now active in Western Europe and has an annual turnover of over € 30 million with approx. 110 employees. Life & Mobility has the ambition to grow into a prominent European player. Because this is accompanied by the necessary extra investments, last year, the process started to find a successor for our holdings. We are pleased that with the new investor Synergia and two managers the conditions have been created to enable further growth. 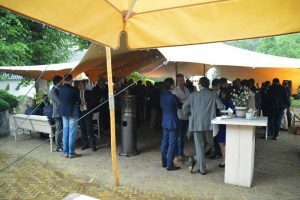 On Tuesday 21 June, more than 140 guests gathered at Brasserie Paardenburg in Ouderkerk aan de Amstel for the festive new start of Berk Partners. With a Haringparty, the renewed independence was celebrated in the presence of numerous relations (shareholders of the funds, participation boards and corporate finance advisers). 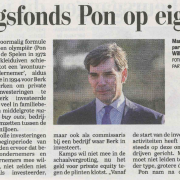 Managing partner Willem Kamps opened with a word of welcome and briefly told about the plans for the new Berk Partners fund. 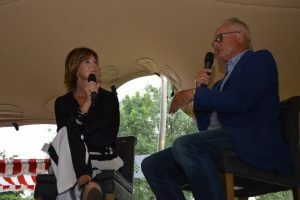 Then former hockey international and RTL presenter Elsemieke Havenga provided a fascinating and instructive interview with former SC Heereveen trainer Foppe de Haan. Topics discussed included the similarities and differences between sport and business life. 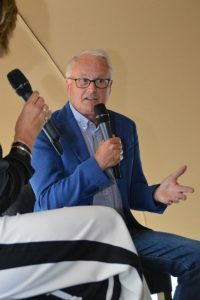 The extensive knowledge of Foppe about the football profession, supplemented with interesting anecdotes from his time at football club Heereveen, turned out to be a great combination. Of course, attention was also paid to the Foppe Fund. This fund is committed to children for whom sports or play is not self-evident because of their physical or mental disability. 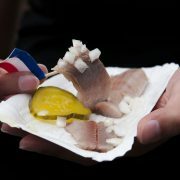 While enjoying a drink, a snack and of course a herring people mingled extensively. We look back on a very successful Haringparty and a good start of the renewed, independent Berk Partners. 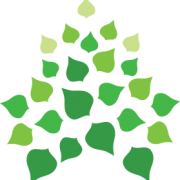 As of 1 May 2016, Berk Partners will be independently engaged again. Of course we remain active in the management of the existing participations, with a part of the portfolio remaining with the merger partner. A new start also offers new opportunities. For example, we are fully engaged in the preparations for a new investment fund. This will be the fifth fund since the founding of Berk Partners in 1992. In this new fund we want to focus on companies active in the (innovative) manufacturing industry, in addition to the more regular management buy-outs and management buy-ins. 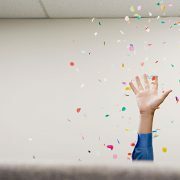 , companies in transition and companies that are ready or need to be prepared for the ‘next step’. So we have even more new, refreshing ideas about investing that we would like to share with you at another time. At the same time with our independence we also introduce a new house style and a new logo. * Berk Partners, the investment company that comes from the investment vehicle of Ben Pon, has always focused on investments in longer-existing, medium-sized, well-run (family) companies from the early 1990s. 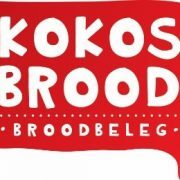 After several successful investments (gin producer Koninklijke Joh. De Kuyper & Zn. And AC Restaurants) third parties, especially experienced entrepreneurs, joined the funds as shareholders. For example, investments were made in (portion) packaging company W. van Oordt & Co and games manufacturer Jumbo (Hausseman & Hötte B.V.). As a Founding Father, Hein Bronk, together with informal investor Berk Partners, started MYbusinessmedia in 2007. Through acquisitions of former Wolters Kluwer and VNU brands such as Schuttevaer, Vraag & Supply, Textilia and Schoenvisie, and further through the acquisition of Media Business Press, Bronk steadily expanded the company further. 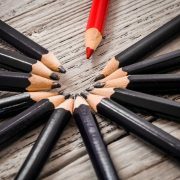 Strong brands, linked to online initiatives, events and internet marketing services brought the company to the position of fourth B2B publisher in the Netherlands with offices in Deventer and Capelle a / d IJssel. 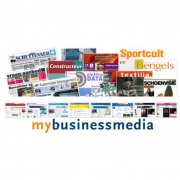 The daily management of MYbusinessmedia is now taken over by Joachim Driessen as managing director and Pascal van Sluijs as managing director. Bronk: “As a shareholder and investor, I stay involved with MYbusinessmedia, but more remotely. I found it after 8 years managing time to pass on the entrepreneurial stick. It is a company with really a lot op opportunities for employees with many energetic people and brands that I am proud of”. 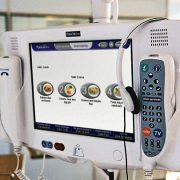 From your hospital bed, after your knee operation, order an extra meal for your family so that you can eat together during the visit. Reserve a parking space close to the entrance. Or discuss the results of the doctor’s visit from your hospital bed directly with your children via video calling. 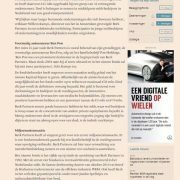 The Brabant company Patientline brings together such services, infotainment and medical information after the summer on their own online platform. With its arrival, Patiëntline is expanding its original market, the rental of televisions and telephones, into a business model that is in line with the ‘bring your own device’ principle that is supported by more and more hospitals. Investors have given a capital injection to accelerate the development of the platform. “We have access to 40 hospitals throughout the Netherlands, reach 12,000 beds and have a good micro payment system. This platform brings all our expertise together, “explains general manager Marco Paans the turnaround. Together with financial director Hans Kwa, he was recruited a year ago to make the company future-oriented. Hospitals take out licenses for the use of the online platform, which can be fully coordinated per institution or even department. The changed course of Patiëntline coincides with the installation of a new Supervisory Board. This exists alongside chairman Theo Huibers, Willem Kamps, Peter Blom and Henk de Boer. Huibers looks at the new course with confidence. “As an experienced and trusted player, Patiëntline is using existing knowledge and expertise with a new proposition in the changing healthcare market. The platform fits the demand from the hospitals. “According to director Paans, the investment and the appointed supervisors, all with knowledge of ICT, media or healthcare, secure the future of the twenty-year-old company. The system is available in several languages, including English, Spanish, Turkish and Moroccan. With this, a transfer to abroad is promising. The first discussions with institutions in Belgium, Ireland and Spain are already taking place.